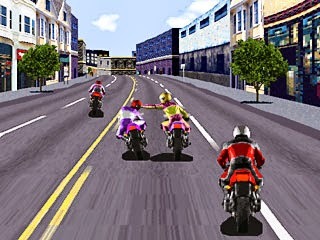 Road Rash have been one of my favorite childhood games. I spent hours running over old ladies and kicking bikers off their bike. Make sure you run "RASH.REG" once to be able to launch the game. If you're having issues with the game's colors, start the game with "start.bat". By the way, the game has multiplayer! Under "game mode" select "Mano-a-mano" and play with a friend!